No matter how identical two organizations are, no two networks are exactly alike. However, many organizations are relying on well-established network topology models. Network topologies outline how devices are connected together and how data is transmitted from one node to another. 7 Which Topology Should I Choose? A logical network topology is a visual representation of how devices are connected and a physical topology details how devices are physically connected. Network topology can be presented as a map that allows an administrator to see the physical layout of connected devices. Having the map of a network’s topology on hand is very useful for understanding how devices connect to each other and the best techniques for troubleshooting. There are many different types of topologies that modern enterprise networks are built on. Established network topologies include bus topology, ring topology, star topology, mesh topology, and hybrid topology. In this article, we’re going to look at each of these topologies to tell you which is best for you. Bus topology is a type of network where every device is connected to a single cable which runs from one end of the network to the other. This type of type of topology is often referred to as line topology. In a bus topology, data is transmitted in one direction only. If the bus topology has two endpoints then it is referred to as a linear bus topology. Organizations using this type of topology will generally use an RJ45 cable to link devices together. There are a number of reasons why bus topologies are widely-used. One of the main reasons is that they are ideal for small networks because they keep the layout simple. You don’t need lots of cables to link devices together and you don’t need to manage a complex topological setup. This doubles up by making bus topologies cost effective because they can be run with a single cable. In the event that more devices need to be added then you can simply join your cable to another cable. However, relying on one cable does mean that bus topologies have a single point of failure. If the cable fails then the entire network will go down. A cable failure can cost organizations a lot of time while they attempt to resume service. Further to this, if you have lots of network traffic then the performance of your network will decrease significantly as all the data will be travelling through one cable. This limitation makes bus topologies suitable only for smaller networks. The primary reason is that the more nodes you have, the slower your transmission speeds are going to be. It is also worth noting that bus topologies are limited in the sense that they are unidirectional, rather than bidirectional like many of the alternative topologies available to you. 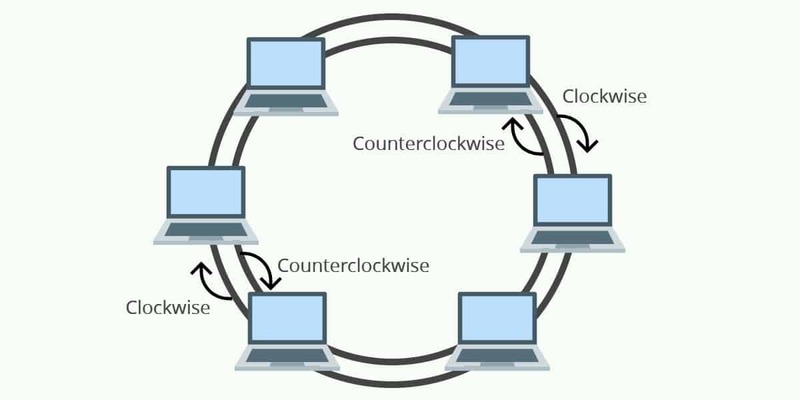 In networks with a ring topology, computers are connected to each other in a circular format. Every device in the network will have two neighbors and no more or no less. The first node is connected to the last node to link the loop together. As a consequence of being laid out in this format packets need to travel through all nodes on the way to their destination. Within this topology, one node is chosen to configure the network and monitor other devices. Ring topologies are unidirectional but can also be made bidirectional. To make ring topologies bidirectional you would need to have two connections between network nodes to form a Dual Ring Topology. Ring topologies can sustain large networks much more effectively than bus topologies. You can also add a repeater to minimize the presence of packet loss while data is in transit. As mentioned above, if ring topologies are configured to be bidirectional then they are referred to as dual ring topologies. Dual ring topologies provide each node with two connections, one in each direction. Thus, data can flow in a clockwise or counterclockwise direction. When using a unidirectional ring topology all data flows in one direction which minimizes the risk of packet collisions. This is compounded by the fact that data can move through nodes at high speeds which can be expanded on when more nodes are added. Dual ring topologies provide you with an extra layer of protection as they are more resistant to failures. For instance, if a ring goes down within a node then the other ring can step up and back it up. Ring topologies as a whole are low cost to install. Even though ring topologies are extremely popular, they are very vulnerable to failure. The failure of one node can take the entire network out of operation. This means that ring topology networks need to be constantly managed to ensure that all nodes are in good health. However, even if your nodes are in good health your network can still be knocked offline by a transmission line failure! Ring topologies also raise scalability concerns. 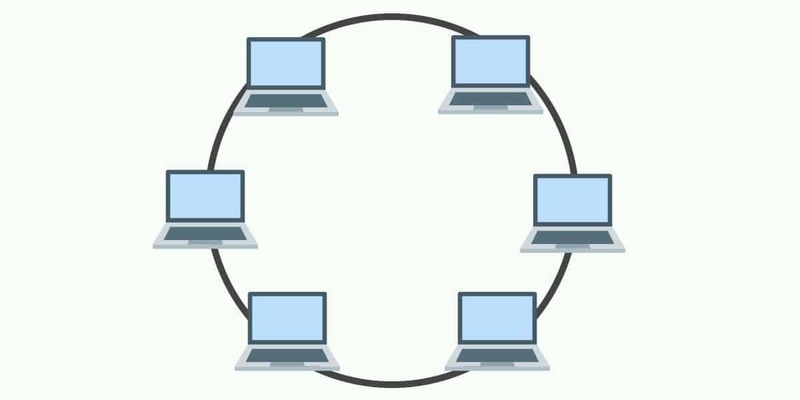 For instance, bandwidth is shared by all devices within the network. In addition, the more devices that are added to a network the more communication delay the network experiences. This means that the number of devices added to a network topology needs to be monitored carefully to make sure that the network resources aren’t stretched beyond their limit. Making changes to a ring topology is also complicated because you need to shut down the network to make changes to existing nodes or add new nodes. This is far from ideal as you’ll need to factor in downtime every time you want to make a change to the topological structure! A star topology is a topology where every node in the network is connected to one central node. 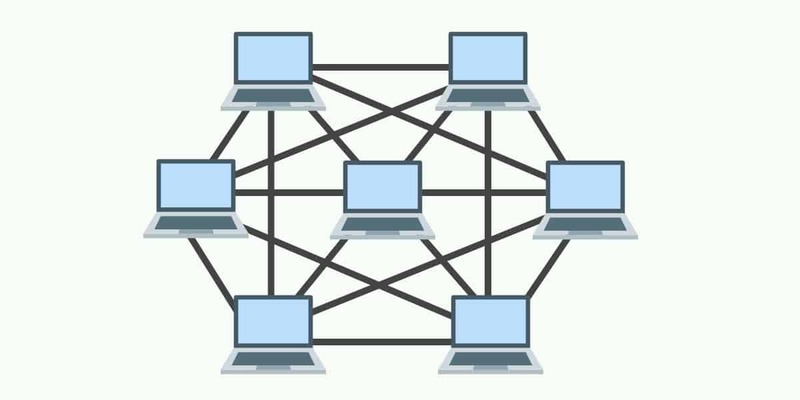 Every device in the network is directly connected to the central node and indirectly connected to every other node. The relationship between these elements is that the central network device is a server and other devices are treated as clients. The central node has the responsibility of managing data transmissions across the network. The central node or hub also acts as a repeater. In star topologies, computers are connected with a coaxial cable, twisted pair, or optical fiber cable. Star topologies are most commonly-used because you can manage the entire network from one location: the central hub. As a consequence, if a node that isn’t the central node goes down then the network will remain up. This gives star topologies a layer of protection against failures that aren’t always present with other topology setups. Likewise, you can add new computers without having to take the network offline like you have to do with a ring topology. In terms of physical structure, star topologies require fewer cables than other topology types. This makes them simple to set up and manage over the long-term. The simplicity of the overall design makes it much easier for administrators to run troubleshooting when dealing with performance faults. Though star topologies may be relatively safe from failure, if the central node goes down then the entire network will go down. As such, the administrator needs to manage the health of the central node closely to make sure that it doesn’t go down. The performance of the network is also tied to the central node’s configurations and performance. Star topologies are easy to manage in most ways but they are far from cheap to set up and use. As the name suggests, a tree topology is a network structure that is shaped like a tree with its many branches. Tree topologies have a root node which is connected to other node hierarchy. The hierarchy is parent-child where there is only one mutual connection between two connected nodes. As a general rule, a tree topology needs to have three levels to the hierarchy in order to be classified this way. This form of topology is used within Wide Area Networks to sustain lots of spread-out devices. The main reason why tree topologies are used is to extend bus and star topologies. 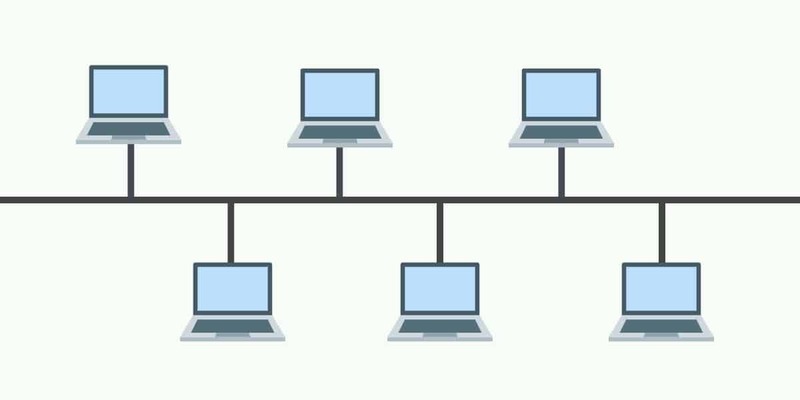 Under this hierarchical format, it is easy to add more nodes to the network when your organization grows in size. This format also lends itself well to finding errors and troubleshooting because you can check for performance issues systematically through the tree view. Tree topologies have a significant weakness which is the central node. If the central node fails then the entire network goes down. Maintaining the network is not simple either, as the more nodes you add, the more difficult it becomes to manage everything. Another disadvantage of a tree topology is the number of cables you need. Cables are required to connect every device throughout the hierarchy in a way that is excessive when compared to a simpler format like bus topologies. A mesh topology is a point-to-point connection where nodes are interconnected. In this form of topology, data is transmitted via two methods: routing and flooding. Routing is where nodes use routing logic to work out the shortest distance to the packet’s destination. In contrast flooding, data is sent to all nodes within the network. Flooding doesn’t require any form of routing logic to work. There are two forms of mesh topology: partial mesh topology and full mesh topology. With partial mesh topology, most nodes are interconnected but there are a few which are only connected to two or three other nodes. A full mesh topology is where every node is interconnected. Mesh topologies are used first and foremost because they are reliable. 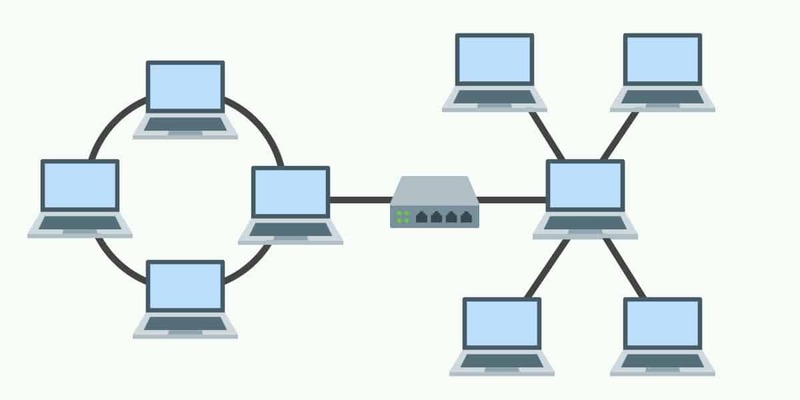 The interconnectivity of nodes makes them extremely resistant to failures. There is no single machine failure that could bring down the entire network. The absence of a single point of failure is one of the reasons why this is a popular topology choice. This setup is also secure from being compromised. However, mesh topologies are far from perfect. They require an immense amount of configuration once they are deployed. The topological layout is more complex than many other topologies and this is reflected by how long it takes to set up. You’ll need to accommodate a whole host of new wiring which can add up to be quite expensive. When a topology is comprised of two or more different topologies it is referred to as a hybrid topology. 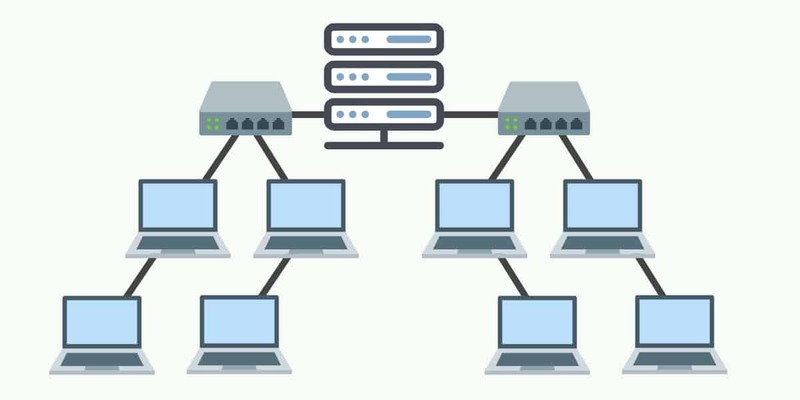 Hybrid topologies are most-commonly encountered in larger enterprises where individual departments have network topologies that different from another topology in the organization. Connecting these topologies together will result in a hybrid topology. As a consequence, the capabilities and vulnerabilities depend on the types of topology that are tied together. There are many reasons why hybrid topologies are used but they all have one thing in common: flexibility. There are few constraints on the structure that a hybrid topology cannot accommodate, and you can incorporate ring, bus, mesh, and star topologies into one hybrid setup. As a consequence, hybrid topologies are very scalable. Their scalability makes them well-suited to larger networks. Unfortunately, hybrid topologies can be quite complex, depending on the topologies that you decide to use. Each topology that is part of your hybrid topology will have to be managed according to its unique requirements. This makes administrators’ jobs more difficult because they are going to have to attempt to manage multiple topologies rather than a single one. In addition, setting up a hybrid topology can end up being quite costly. Which Topology Should I Choose? First, you need to take into account the length of the cable you need to provide service to all your network devices. A bus topology is the most lightweight in terms of cable needs. In this sense, this would be the simplest topology to install and buy cable for. This ties into the second factor, you need to consider the type of cable you’re going to use. Cable types range from twister pairs to coaxial cables and optical fiber cables. The cost of installing the topology is also very important. The more complex the topology is to set up, the more you’ll need to pay in terms of resources and times. For example, a bus network won’t cost you as much as a mesh network that requires lots more wires and set up. The final factor you’ll want to take into account is scalability. If you’re planning to upscale your network infrastructure in the future you want to make sure that you use a network that is easy to add devices to. A star topology network is ideal for this because you can add nodes with minimal disruption. This isn’t as simple within a ring network because you will incur downtime if you add any nodes. Now that we know the different types of topology, it is time to consider how to design your network from scratch. There are a number of software products that allow you to create your own network topology diagrams. Network topology diagrams show you a diagram of how your network connects together and helps you to create an efficient network design. It also provides you with a reference point that assists you when you attempt to run troubleshooting to fix faults. There are many different network topology mapping products out there but one of the most widely-used is Microsoft Visio. With Microsoft Visio you can draw up your network by adding network elements to a canvas. This program allows you to design a diagram that details your network. Of course drawing up your own network isn’t always ideal particularly when you’re attempting to map a larger network. 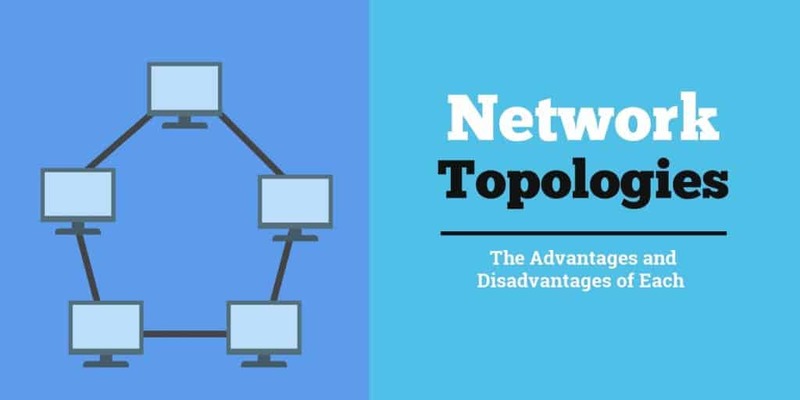 As a result, you might want to consider using another tool like SolarWinds Network Topology Mapper which can autodiscover devices connected to your network. Autodiscovery comes in handy because it means that you don’t have to draw up your network structure manually. The network topology you choose for your enterprise should be deeply rooted in your usage requirements. 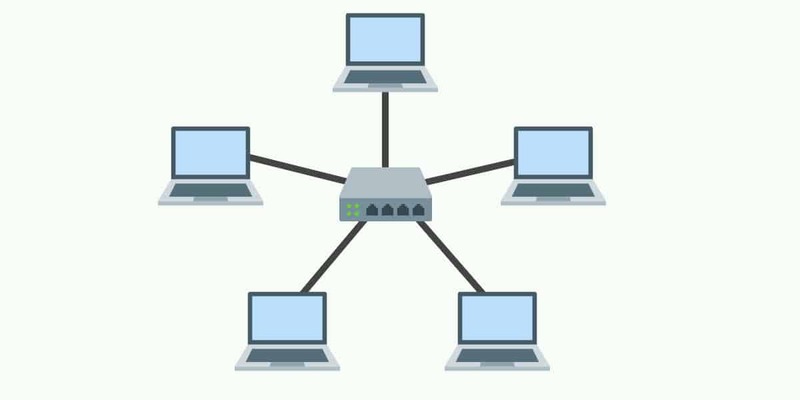 The number of nodes you have in your network will determine whether you can make it by using a bus topology or whether you’re going to need to deploy a more complicated mesh or hybrid setup. Don’t make the mistake of thinking that some topologies are better than others. They all have their advantages and disadvantages depending on the environment they’re applied within. Once you’ve given some thought to what topology you want to use you can make the move to deploy it. One good way to plan ahead is to use a network topology mapping tool to draw up the layout that you’re going to use. Using a tool like SolarWinds Network Topology Mapper will allow you to plot your network on a diagram to view your topological structure in one place.